This week, the IDF's 36th Division – the "Ga'ash" Formation – held an exercise including infantry, armor, artillery and engineering forces. 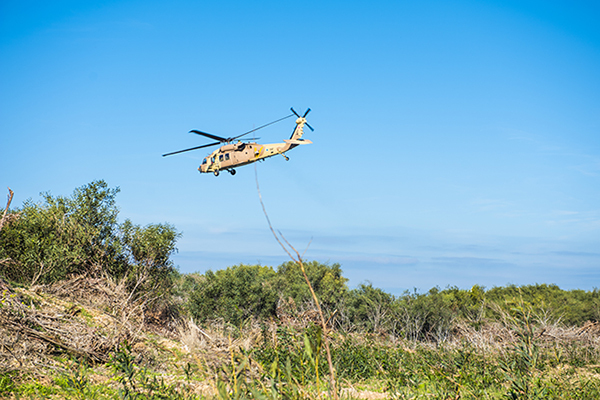 As part of the exercise, the forces drilled combat in the northern theatre alongside the IAF. The exercise is part of a plan proposed by the Commander of the IAF to increase the air force's participation in ground training. 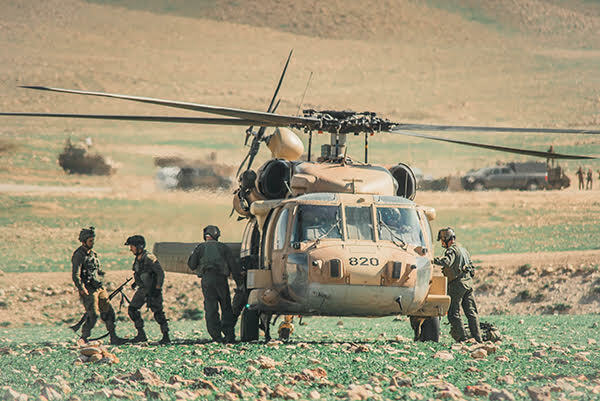 The participating aerial forces were squadrons from the IAF's various divisions, including attack helicopters and RPAVs (Remotely Piloted Aerial Vehicles). "The first combined exercise of this sort – held last year – led to a significant change in the IAF's mindset", explained Lt. Col. D', Head of the Exercise Team at the IAF Cooperation Unit. "We learned how to effectively utilize the air force's power in operation alongside the ground forces. We realized that the combined forces had great potential, which could then be used in the battlefield. This exercise allows us to develop this potential". "We drilled a situation where a logistical request climbed the ranks from the field all the way to the headquarters", described Lt. Col. D'. 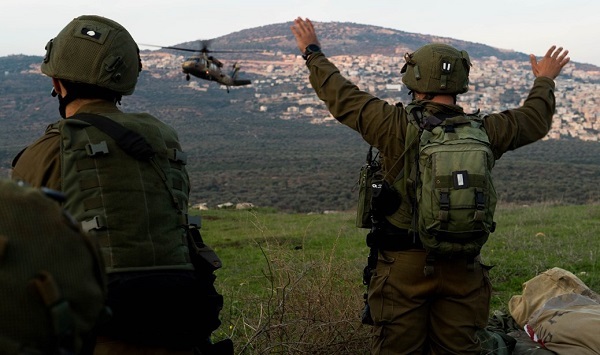 "When an IDF Division is in the field, the forces estimate when they'll require medical supplies, ammunition and food. When the need arose during the exercise, tactical transport aircraft flew over the forces and airdropped the necessary supplies. The air force's capabilities allow it to meet the ground forces' needs". In past exercises, the force's squadrons would be on standby for providing air support. However, this time was different. "The squadrons would receive operational orders and updated intel from the IAF HQ Control Center, working with them in close cooperation", elaborated Lt. Col. D'. "In addition, we had service members posing as hostile aerial forces in order to challenge the participating squadrons". "All participating forces had one common mission – winning. Each division had a different role to play, but they all shared the same goal", said Lt. Col. D'. "The RPAV squadrons were responsible for intelligence and surveillance; the transport helicopter squadrons were responsible for troop transport and casualty evacuation; the fighter squadrons were responsible for striking targets; and the attack helicopter squadrons provided air support". "Imagine an infantry battalion that needs to get from point A to point B. Before arriving at a house it is about to break into, a bomb falls on the house nearby and neutralizes a significant threat. The whole thing would have worked out differently if it wasn't for the air force's assistance", demonstrated Lt. Col. D'. "It's important to utilize the full extent of the participating aerial force's capabilities". How does the cooperation between the ground forces and the aerial forces work? When an attack helicopter is called for assistance, he teams up with the ground forces and plans according to the situation in the field. "This planning includes targets to strike, areas to scan and the ETA (Estimated Time of Arrival)", elaborated Lt. Col. A', Commander of the 113th ("Hornet") Squadron, which operates "Saraf" (Apache Longbow) attack helicopters. "Providing air support is the attack helicopter's main mission, but it is no longer the only one. In today's reality, the battlefield has become dynamic and especially complex, which means that the division is prone to changes. Nowadays, we not only provide assistance, but also perform attack sorties and participate in search and rescue missions". 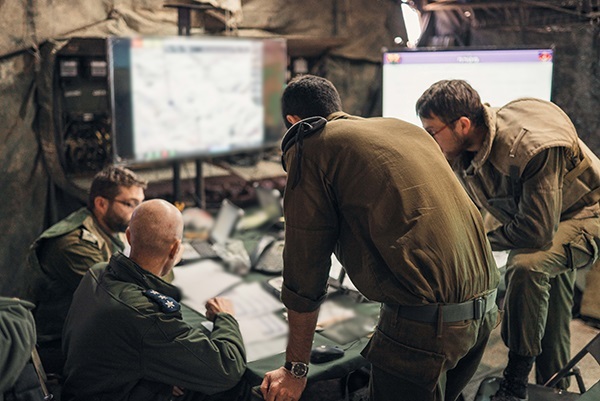 In terms of theory, this cooperation isn't simple at all, and there are many differences between the IAF and the IDF Ground Arm, including professional discourse and work hours. "One of the challenges in participating in the exercise is getting to know the ground forces and their needs", said Lt. Col. A'. "These exercises are important – if the aerial forces don't learn how to communicate with the ground forces while training, they definitely won't know how to communicate during wartime. We need to think about these exercises as a way to make the most out of our cooperation, which is a significant aspect of the squadron's essence". Lt. L', an aircrew member at the participating 190th ("Magic Touch") Squadron, which operates "Peten" (Apache) attack helicopters, also cared to emphasize the importance of cooperating with the ground forces. "Training alongside the ground forces requires that we study the division's operational plan thoroughly in order to see where we fit in. These are things that have to be planned in advance, up until the night of the operation".